Mike Holovak, an All-American running back at Boston College who became one of the first head coaches of the Boston Patriots, died yesterday in Ruskin, Fla., of complications from pneumonia. He was 88. Mr. Holovak starred at Boston College before his graduation in 1943, when he entered the Navy. He was selected to be the skipper of a PT boat operating in the South Pacific, a demanding role given to the most physically fit officers. "He rarely spoke of it, but he was so proud of that service to his country. They were shot at the first night they were in the Pacific," said Pauline Scudder Holovak, his wife. Mr. Holovak, whose boat was credited with sinking nine Japanese ships, retired from the Navy as a lieutenant commander. Following the war, Mr. Holovak played professional football for the Chicago Bears and Los Angeles Rams, before returning to Boston College as a freshman football coach in 1949. He was named head coach at BC in 1951, leading the Eagles to a 49-29-3 record in nine seasons. 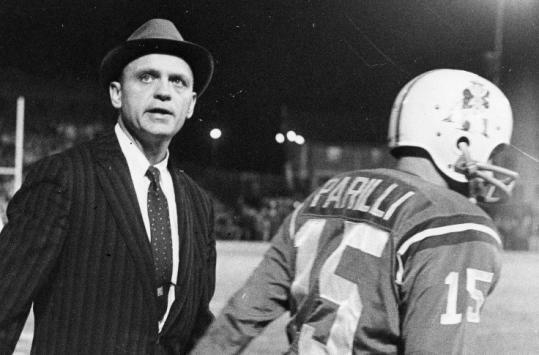 When the Boston Patriots of the American Football League were founded in 1960, Mr. Holovak was appointed the first director of player personnel, a position he held in addition to assistant coach. In 1961, Mr. Holovak was promoted to head coach five games into the season. "From that day, the morale went sky high among the players," Patriots Hall of Famer Gino Cappelletti recalled. "As a coach, he had the ability to really have you believe in yourself. Having been a player himself, and a good one, he just seemed to know how to get the most out of his players. I know personally that he was so instrumental in whatever successes I enjoyed as a player." Mr. Holovak served as head coach through the 1968 season, and his 53 victories (53-47-9) rank second in franchise history after the current coach, Bill Belichick (105). One highlight of his tenure came in 1963, when the Patriots won their first playoff game before losing in the AFL championship game to the San Diego Chargers. Cappelletti remembered Mr. Holovak as a "true gentleman." "He could express himself without having to swear. That was one thing I always liked about him," he said. "He had a strong concern for each player as an individual. He was very loyal to the players who played for years with him, and because of that it was very difficult for him to release them when he thought their playing days [were] over. I think that gives you an idea of the inner person." Former players at Boston College remembered Mr. Holovak in a similar light. "It was a great experience to have played for Mike," said John J. Burns Jr., a 1953 BC graduate. "Not only was he a great football innovator, each player was an individual to Mike and he treated everybody with great respect. He would never yell or scream, even if it might have been needed." Mr. Holovak later coached and held administrative positions with the San Francisco 49ers, Oakland Raiders, and New York Jets before finding a more permanent home with the Houston Oilers (now the Tennessee Titans) as president of player personnel and general manager. He retired from football in 1998 but remained a consultant for the team until shortly before his death. "Mike was the quintessential 'football guy,' " said K.S. "Bud" Adams Jr., founder, owner, and president of the Titans. "He had such a passion and knowledge of the game. It is rare when you see a person excel in all three areas of the sport - a great player in college, a successful coach, and great talent evaluator - but Mike was one of the special people. "He was one of the finest and most effective evaluators of playing talent in the history of our organization. "His induction into our team Hall of Fame, the only front-office member ever inducted, speaks volumes to the impact to our organization. More than that, he was a true gentleman and a man of great integrity," Adams said. Mr. Holovak was born in Lansford, Pa., to Czechoslovakian immigrant parents. He worked as a church sexton to support his family following his father's death. Although Mr. Holovak believed his football career would be cut short because of his responsibilities, his high school coach helped him earn an athletic scholarship to Seton Hall Prep School in New Jersey, where his talents were scouted by Boston College football coach Frank Leahy. Mr. Holovak enrolled at BC and was the starting fullback on the Eagles' undefeated 1940 Sugar Bowl championship squad. He was a consensus All-America selection as a senior in 1942. In his final season at Boston College, he scored three touchdowns and averaged 15.8 yards every time he touched the ball, a record that has stood for more than six decades. Fans often chanted "Give it to Mike!" when the Eagles faced a critical situation. Mr. Holovak is a member of the National Football Foundation College Football Hall of Fame, the Boston College Varsity Club Hall of Fame, the Tennessee Titans Hall of Fame, and the Seton Hall Prep Hall of Fame. Patriots chairman Robert Kraft called Mr. Holovak one of the "founding fathers" of the Patriots. "The entire Patriots family is saddened by Mike's passing," Kraft said. "Mike Holovak was a great coach and a wonderful person." In addition to his wife, Mr. Holovak leaves daughters Michele Harrison of Gloucester and Cindy Oatess of South Tampa, Fla.; and three grandchildren. Another daughter, Terrie Anne, has died. A Mass will be said 10 a.m. Feb. 9 in St. Ignatius Church on the Boston College campus.